Rings are fairly common in the Solar System – Saturn’s are the most famous, of course, but Jupiter, Uranus, and Neptune all have rings as well. They have also been discovered around two asteroid-like objects called centaurs, Chariklo and Chiron, between Jupiter and Neptune. 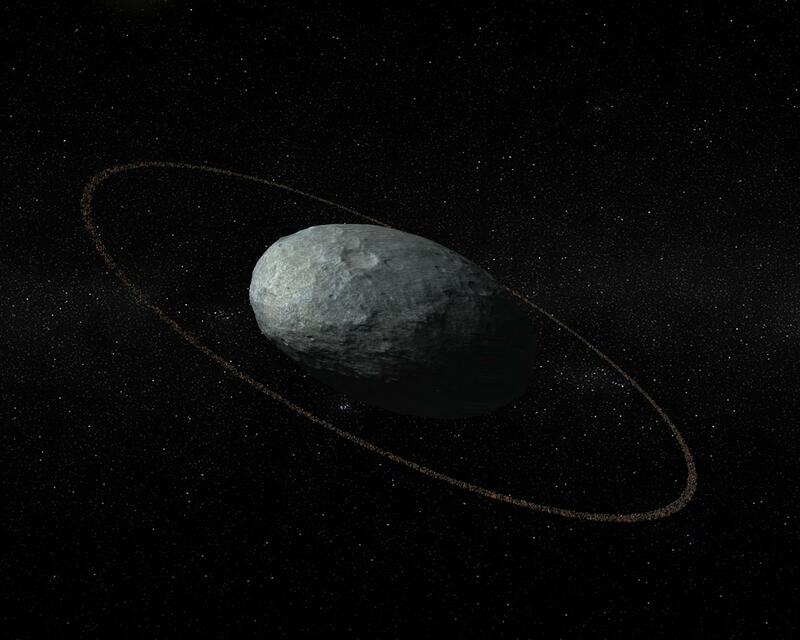 Now, another ring system has been found, this time around the dwarf planet Haumea, which orbits the Sun way out past Pluto. The ring was discovered by astronomers from the Institute of Astrophysics of Andalusia and the study has been published in the journal Nature. The astronomers found the ring by observing Haumea as it passed in front of a background star (an occultation). Haumea is one of four dwarf planets known to exist beyond Neptune, including Pluto, Eris, and Makemake. 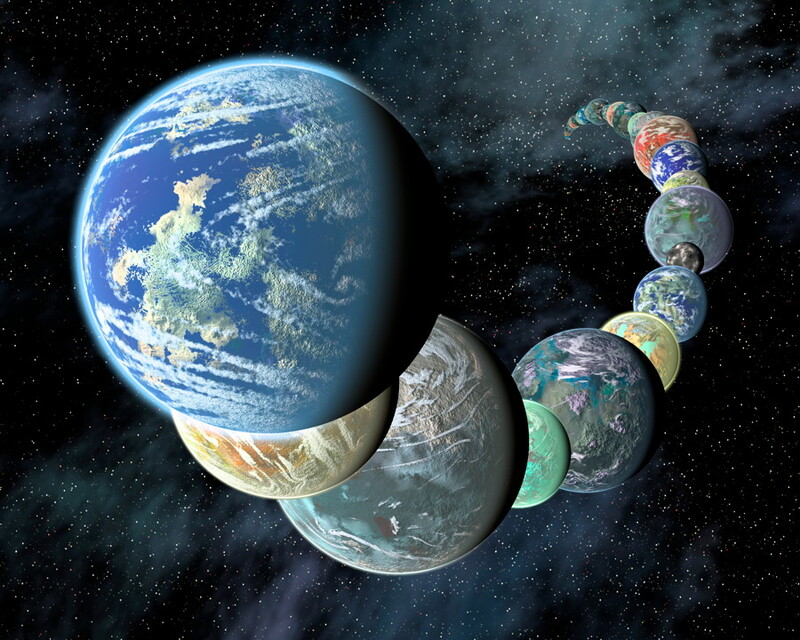 It is elongated and egg-shaped rather than round, and its longest axis is 2,320 kilometres, almost the size of Pluto. While it takes 284 years to orbit the Sun, it spins rapidly on its axis, taking only 3.9 hours to complete one rotation. The discovery was unexpected, and Haumea is now the most distant object in the Solar System known to have rings. When New Horizons flew past Pluto in 2015, it searched for any rings that might be there, but did not find any. The ring lies at a distance of 2,287 kilometres from the center of Haumea and is darker than the surface of the dwarf planet itself, making it difficult to detect. The ring is also on the equatorial plane of Haumea, as is the dwarf planet’s largest moon, Hi’iaka (there is also a second smaller moon, Namaka). Appearance-wise, the ring resembles those of Uranus and Neptune. Haumea and Hi’iaka are both thought to have water ice on their surfaces. So how did the ring form? “There are different possible explanations for the formation of the ring; it may have originated in a collision with another object, or in the dispersal of surface material due to the planet’s high rotational speed,” said Ortiz. The observations also showed that Haumea probably lacks a global atmosphere like Pluto’s. If Haumea has a ring, how many other small bodies in the outer Solar System might as well? Only further observations will help to answer that question; perhaps New Horizons will find some new ones as it continues its journey deeper into the Kuiper Belt beyond Pluto. This article was first published on Futurism.